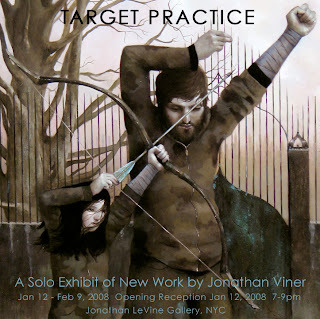 Jonathan Viner (Weiner) is having a solo exhibit opening this Saturday at Jonathan LeVine Gallery in New York. It should be a great show and anyone in the area should check it out... even I'm driving up to New York from Pittsburgh to drop in on the excitement. And there's sure to be a Viner/Kehoe dance battle at some point, so be sure to stick around for the after party as well. Hopefully he doesn't put my into the Royce Gracie arm bar, pretzel death grapple maneuver that I've heard of him using every now and again... and from what I know, no one's ever escaped that move... yet.